This week's post comes courtesy of good friend and colleague, Theresa Christensen, a.k.a. "Grading Girl". A shining example of what it means to be a connected educator, Theresa uses this post to share her passion, and her experience with blogging as an authentic expression of learning. "RATIONALE FOR BLOGGING: Exuberantly experiencing my own blogging adventures led me to begin blogging with my students over the past three years. Both the Common Core and my school district’s Critical Learning Standards emphasize the need for students to read a variety of text for understanding, write clear, supported arguments and apply knowledge and skills to real-world problems. I believe writing blogs can fulfill those expectations. "Blogging provides students with digital writing experiences to pursue understandings in the real world, not just within a classroom." It’s no longer a matter of earning a grade – it’s a matter of voicing views to a real audience. 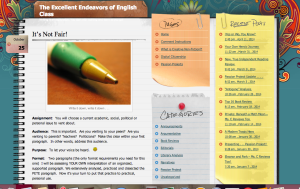 Moreover, blogging across the curriculum, not just in English class, allows for both formative and summative assessment because it helps writers see the progression in development of a piece of writing. It may actually take more talent and skill to create an interesting persuasive post on the French Revolution, let’s say, than a traditional essay. Like an essay, a persuasive post needs to be clear, concise, and convincing; on top of this, there is the overriding need to be compelling. That said, we need to teach blogging as a skill to help students voice arguments succinctly as they prepare for communication in the competitive job market they will take on later." Read the rest of this terrific post here; "Blogging Bound; My Students' First Digital Steps"